Scholars and policymakers have long known that there is a strong link between human development and spending on key areas such as education and health. However, many states still neglect these considerations in favour of competing priorities, such as expanding their armies. This book examines how states arrive at these decisions, analysing how democratic accountability influences public spending and impacts on human development. The book shows how the broader paradigm of democratic accountability – extending beyond political democracy to also include bureaucratic and judicial institutions as well as taxation and other modes of resource mobilisation – can best explain how states allocate public resources for human development. 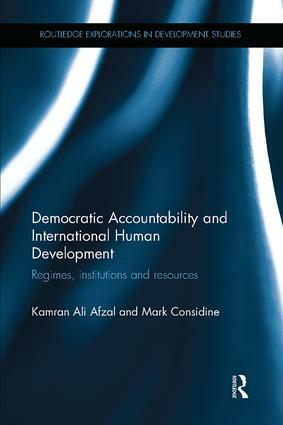 Combining cross-country regression analysis with exemplary case studies from Pakistan, India, Botswana and Argentina, the book demonstrates that enhancing human capabilities requires not only effective party competition and fair elections, but also a particular nesting of public organisational structures that are tied to taxpaying citizens in an undisturbed chain of accountability. It draws out vital lessons for institutional design and our approach to the question of human development, particularly in the less developed states. This book will be of great interest to postgraduate students and researchers in the fields of political economy, public policy, governance, and development. It also provides valuable insights for those working in the international relations field, including inside major aid and investment organisations.